We’d love your help. 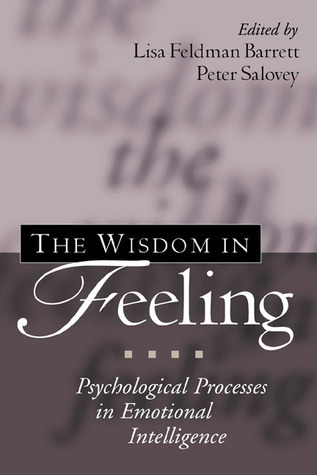 Let us know what’s wrong with this preview of The Wisdom in Feeling by Lisa Feldman Barrett. Emotional intelligence has emerged as an area of intense interest in both scientific and lay circles. Yet while much attention has been given to the measurement of an "EQ," little has been written about the psychological underpinnings of emotional intelligence. This book fills an important gap in the literature, linking the ideas embodied in the emotional intelligence conc Emotional intelligence has emerged as an area of intense interest in both scientific and lay circles. Yet while much attention has been given to the measurement of an "EQ," little has been written about the psychological underpinnings of emotional intelligence. This book fills an important gap in the literature, linking the ideas embodied in the emotional intelligence concept to ongoing research and theoretical work in the field of affect science. Chapters by foremost investigators illuminate the basic processes by which people perceive and appraise emotion, use emotion to facilitate thought, understand and communicate emotion concepts, and manage their own and others' emotions. Incorporating many levels of analysis, from neuroscience to culture, the volume develops a broader scientific basis for the idea of emotional intelligence. It also raises stimulating new questions about the role of emotion in adaptive personal and social functioning. To ask other readers questions about The Wisdom in Feeling, please sign up.